Every year I like to look back at the books that we really loved. The ones we read again and again. Sadly, the list is getting shorter and shorter. Will has grown away from picture books and is reading lots of chapter books on his own. He's a one and done kind of kid, moving on to the next thing rather quickly. And our reading habits are changing — when Will was little we'd read an average of three books a night. Now most nights, Will picks a book and Joseph picks a book. And sometimes now Will's book he is off reading on his own and Joseph's book is brought from school so our own books aren't getting read again and again. But the main thing is we are still reading. Reading is good. Will finished up the Magic Tree House series. And the Bad Kitty series is hilarious. 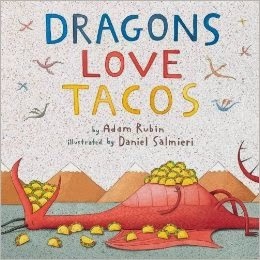 "Dragons Love Tacos" by Adam Rubin with illustrator Daniel Salmieri came home from the library for Joseph but ended up a favorite of Will's as well. Santa even brought us our own copy after it was checked out several times from the library (a true sign of a favorite here). Will loves going to the school library and is still bringing home lots of Eyewitness Books. Joseph had me read "Sheep in a Jeep" by Nancy E. Shaw with illustrator Margot Apple again and again. It's been a favorite forever and was on the 2011 list as well. But the real "star" of the year was "Lego Star Wars: Save the Galaxy!" It's a large format board book that recounts the first movie (I don't count those prequels!). In fact, I read it again just last night. Dinosaur books still top his list and Santa brought two new ones. I'll admit that I pass the dino books over to Chris to read because he does a better job pronouncing all the crazy names. 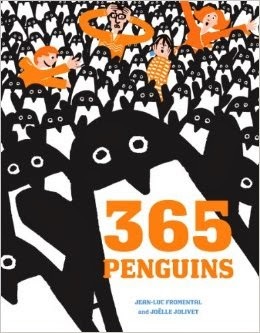 Another favorite of ours that I don't think I've mentioned before is "365 Penguins" by Jean-Luc Fromental with illustrator Joelle Jolivet. I really don't remember how the book came into the house (how can I not? I find this weird) but the charming book about a family dealing with a slow invasion of penguins is well, charming! And funny. We've had it for awhile but we read it again and again. In a very unusual move for me, I actually read two books in 2013 that were actually published in 2013. Crazy I know. "We Are All Completely Beside Ourselves" by Karen Joy Fowler made several Best of 2013 book lists and was much better than I expected. I also read "Amy Falls Down" by Jincy Willett. For 2014, I've got a long list of books to read, most recommended by friends. I haven't wading into the Game of Thrones fandom yet. I'm already in the deep end for Doctor Who and Sherlock. I asked friends on Facebook — read the GOT books or skip 'em and watch the shows? I thought it would be a 50-50 debate but overwhelmingly the consensus was to read the books. I'm sure Chris would love that though. When I get my hands on a good book, I tend to ignore the house. Case in point, around the first of December I randomly picked up the first book in The Mortal Instruments series, "City of Bones" and torn through the five books available in about a week (dishes, what dishes!) only to have the tortured love story come to a screeching halt with book six coming in March! Better than Twilight but not a good as Hunger Games is where I'd rank it. YA fiction has so much to offer these days. So besides "The Goldfinch" — which I can't wait to read, why do I not have a copy yet?! — what did you love in 2013? What is on your must-read list for 2014?